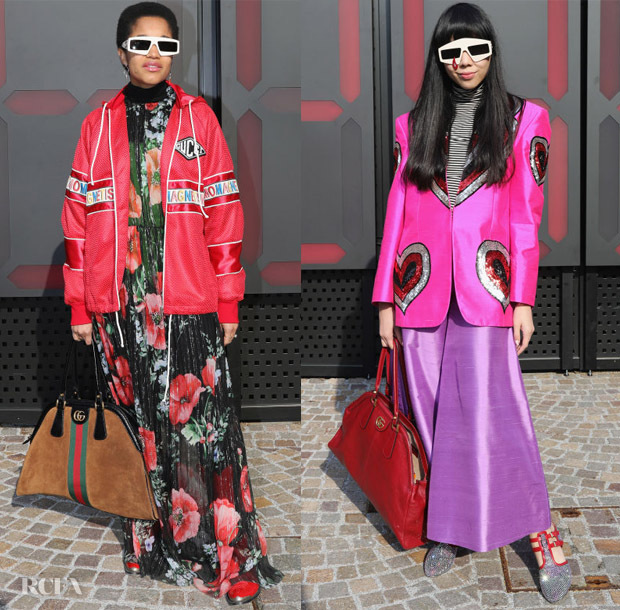 Milan Fashion Week is in full swing, with the Gucci Fall 2018 show held on Wednesday (February 21) and style darlings in attendance. Rowan Blanchard: Not only did the lime-green hue of this jumpsuit draw me in, so too did the retro-modern influences that Rowan flaunted so flawlessly. I love the spark of the contrasting magenta-pink handbag for a girlish finish to echo her beauty look. Chloe Sevigny: There was a distinct throwback vibe in this jumpsuit ensemble, too, that played with volume in the pouf sleeves and pants. I do think the cross-body bag was a bit of a distracting interference. Miriam Leone: The more interesting element of this ensemble was the back, with the Bob Mackie reference and embellished gown’s deconstructed bow. Yet, the fit and execution still left something to be desired. Tamu McPherson: The fashion influencer offered up a creative look that artfully combined the romance of the floral dress with an urban-inspired track jacket and futuristic techno shades. If there was one element I would remove, it would be the classic Gucci bag. Susie Bubble: The influential style blogger also left nothing on the table when it comes to her statement look. The 3D-inspired shades also came into play here, and when paired with the embellished heart jacket, grand palazzo pants, and glittery shoes in bright, girly hues, the effect was animated and nearly cartoonish—in the best possible sense of the word.